A classic French Lobster Bisque recipe has to be the epitome of the meaning of the word Bisque; best described as a thick, creamy soup. 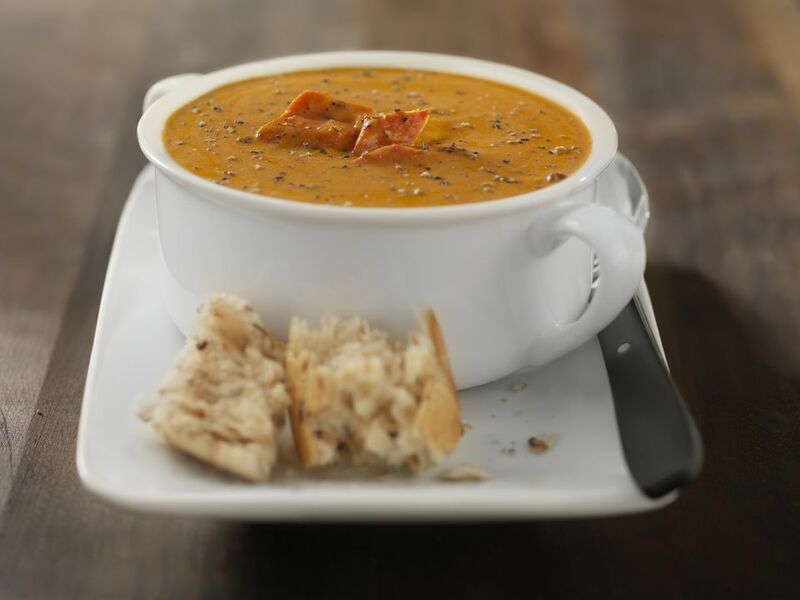 A bisque is more often, though not exclusively, made from shellfish be it crab, lobster, crayfish and the like. Here, the delicious briny lobster meat swims in a thick, well-seasoned cream. Do not, however, be fooled by the simplicity of this recipe. This is a highly sophisticated dish yet is versatile enough to be both a dinner party special or even a simple light lunch. Pair the bisque with baguette slices, perhaps an Avocado and Romaine Salad, and a glass of chilled Chardonnay for the ultimate sublime soup experience. For a dinner party or special supper, serve the bisque as a starter with thin slices of baguette for a truly French feel. Melt the butter in a large pan, once melted add the flour, a pinch of salt and pepper and the paprika. Stir well. Slowly whisk in the milk, followed by the chicken stock, the white wine, and continue stirring until a smooth and slightly thickened to a cream-like consistency. This stirring can take several minutes but spending the time at this stage of the bisque is critical to the success of the dish. Be careful not to let the mixture boil as this may cause the bisque to curdle. Add the onion, the carrots and simmer (again, do not boil) for 10 minutes. Add the cooked lobster meat and stir. Taste the bisque and adjust the seasoning to your liking. Stir in the Cognac and finally, the cream. Heat through until piping hot. Serve in hot bowls with a crusty baguette on the side. The bisque can be made in advance of serving, in which case prepare until just before the lobster meat is added. Chill the soup and store in the refrigerator until needed, but not longer than one day. Proceed with the recipe as described above. The bisque above is a chunky textured version of the classic soup. You can purée or blend the soup before adding the lobster meat and proceeding with the recipe. This blending will create a silky textured bisque, considered by some to be the right texture. Both methods are excellent.